Hank Beckmeyer and his wife, Caroline, met while he was on tour in Europe with his band Half Japanese. He left the band and the tour to remain with her in Europe. Over the next few years they became immersed in the great wines of Europe and started to wonder whether this was something they could do themselves. They settled on the Sierra Foothills and in 2001 they purchased the property that is La Clarine (Cowbell) Farm. 2600 feet up in the foothills they planted 2 acres of vines, mostly Tempranillo but also including Syrah, Tannat, Grenache, Negroamaro, Cabernet Sauvignon, and some unknown vines that emerged from seeds in the compost heap. The vineyard is farmed following the farmer-philosopher Masanobu Fukuoka's 'do nothing' methods. As the name implies, the vineyard is allowed to grow wild, with weeds, insects, birds, and all sorts of life teeming among the vines. From this vineyard he produces a single wine in extremely low quantities. For the rest of his wines he purchases fruit from like-minded farmers in the area. He makes a variety of bottlings but handles all of his wines using some essential methods: Native yeasts, neutral or no oak, and minimal sulfur. The goal here is to keep his wines fresh and pure expressions of their individual terroirs. 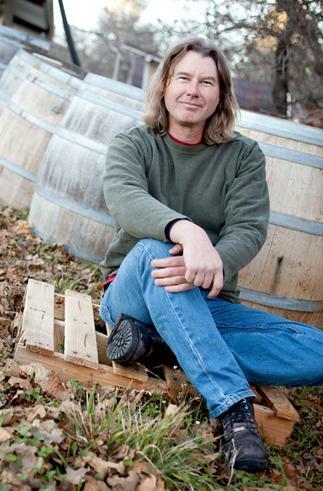 Hank's wines are made without thought given to critics, scores, popular styles, or anything else. They are simply the wines that he wants to make and the results speak for themselves. Each bottle is distinctive and alive, a testament to the surprises you can find in a bottle simply marked 'domestic'.